I was asked by a friend if I could review and suggest children’s books on some of my posts. Specifically, books that dealt with special needs. I loved the idea! It also made me think. I really have not read a lot of children’s books in this area. It’s not that they don’t exist. I’ve just never searched for them. If they are all like the first book I read, then I have been MISSING OUT! This book was written by Holly Robinson Peete and her daughter, Ryan Elizabeth Peete. Holly Robinson Peete’s son, RJ, was diagnosed with Autism at age 3, so that family has first hand experience. 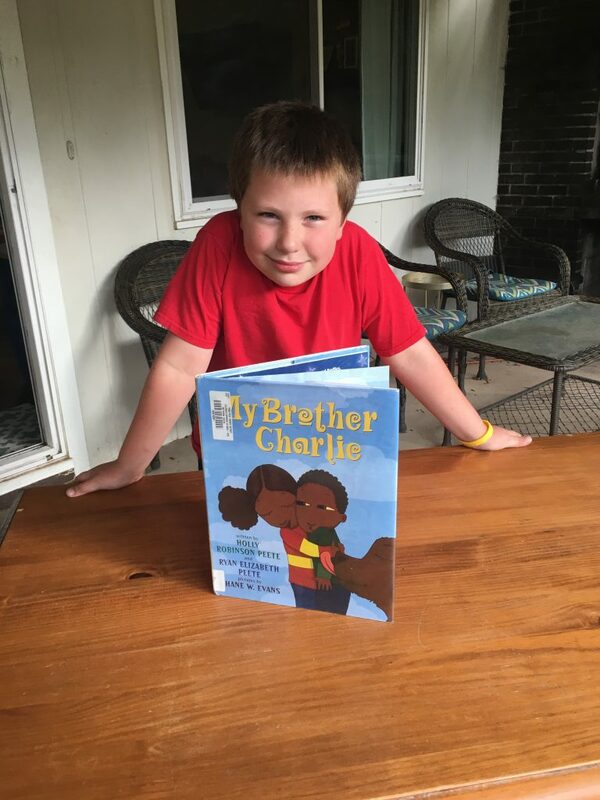 The story is told by a little girl, Callie, about her twin brother Charlie. I’m not going to lie, I teared up reading this special book. A could have written this book about E. It tugged at all of my heart strings. I really loved how the authors explained what Autism is in a very simple way. I can see that this would be a fantastic book to help your children come to understand a loved one’s recent diagnosis. The best part of the book, in my opinion, is how it embraces Charlie while giving awareness to how Callie may feel at times. When E was little, we didn’t have a diagnosis. There were very few families we spent time with, mostly because E was irritating and disruptive. No matter what methods we tried, we could not get through to E. We thought that we were “bad parents”. We weren’t bad parents, we simply did not have the tools. A didn’t have the tools either. I have wondered over the past few years if A and E would fight as much if we could have gotten E’s diagnosis earlier. If we had known what we were dealing with and sought treatment, perhaps at least some of the issues would not have been so overwhelming. E went through a horrible biting phase and A was his primary target. A read this book yesterday and she thought it was sweet. She could relate to some of the feelings that Callie had about Charlie and Autism. When you are dealing with special needs or really any obstacle, I really don’t think that there is a such thing as too many tools. I won’t make the same mistake with C. We will be adding books to our arsenal so that she can understand E’s view of the world a bit better. This will be one of them! Bottom Line: I would definitely recommend this book and I hope each of you will read it with your families. 1 in 68 children are living with Autism. It is very likely that even if it does not directly affect your family, you will experience it at least peripherally. Do you have a book I should read? Let me know! This one sounds fantastic! We tried one called “my brother is autistic” for our 6 year old son which was too wordy and didn’t have much effect. Then we got “I see things differently” from the perspective of a child with autism. It was simple and easy, but clear. So I would recommend the latter as a good read for children to understand autism. I will look into “I See Things Differently” for sure! “Waiting for Benjamin” might also be a good match for your family!